Butterfly explosion? Chances are they're snouts. If you ask Texans to name a butterfly that migrates, chances are good they’ll name the monarch. Yes, few butterflies are as iconic and beloved as our dear monarch, but it is not the only butterfly that migrates en masse. Indeed there’s another, albeit less regal, butterfly with a migration that’s nothing to turn your nose up at. That’s right, if you put your nose to the grindstone and do a little digging, you can find astounding reports of a butterfly migration that rivals or even surpasses that of the monarch ... if you have a nose for that kind of thing. Enough with the “nose” idioms? The American snout butterfly (Libytheana carinenta) is aptly named and instantly recognizable by its very long, namesake facial feature. The species is not unique among butterflies in its sizable schnozz: three other snout butterflies occur in the Caribbean. But in Texas, if you see a snout, you can be sure that it’s an American snout. 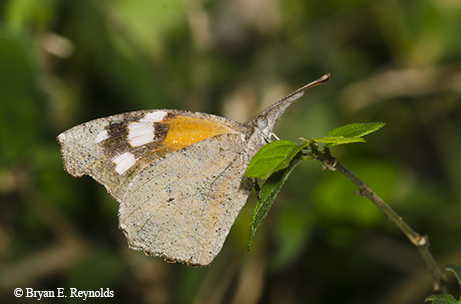 The American snout butterfly should be better known to all Texans, not only because of its singular morphology but also because of its remarkable migrations during which butterfly densities reach plague-like proportions, particularly in South Texas. Consider a report from the late 1800s, for example, when swarms of the butterfly were observed stretching from Fredericksburg to Karnes City — a distance of more than 100 miles. And don’t think for a minute that we’re using the term “swarm” lightly. A swarm in 1916 was reported to be sufficiently dense that the butterflies clogged vehicle radiators and caused engines to overheat. The butterflies usually fly close to the ground, but a swarm in 1966 was so thick that streetlights had to be turned on after the daytime sky was darkened with butterflies. In 1921, an estimated 75 million butterflies per hour passed through South Texas in a particularly large wave that stretched for nearly 250 miles. To put that in perspective, the entire eastern monarch population during the winter of 2016-2017 was estimated at just over 81 million individuals. That’s essentially every monarch in North America east of the Rockies, save for a few snowbirds that hang out around the Gulf Coast, compared to 75 million American snouts passing by in a single swarm, in a single hour. The flight lasted for 18 days. The verdict is still out on what causes these incredible butterfly aggregations, but population size appears to be correlated with the intensity and duration of droughts that precede drought-busting rains. In other words, if big rains follow big droughts, big snout populations may be on their way. Intense drought periods may help reduce parasites that impact snout populations, and when heavy rains follow, snout caterpillars are assured to have an abundant supply of their favorite foods: fresh hackberry leaves. When conditions favor an explosion of American snout butterflies, the chance for a young male to successfully find a mate is low because of competition with other, older males. So it may be that mass migrations are triggered by amorous young males moving in search of potential mates, but again, no one knows for sure. No matter the causes for the bewildering numbers of American snout butterflies that can periodically dominate the skies in South Texas, there is no question that the butterfly with a prodigious proboscis is a special part of the Texas landscape. Yes, it should be as plain as the nose on your face that the American snout butterfly is certainly no butterfly to look down your nose at. Adults imitate dead leaves by clinging to branches.